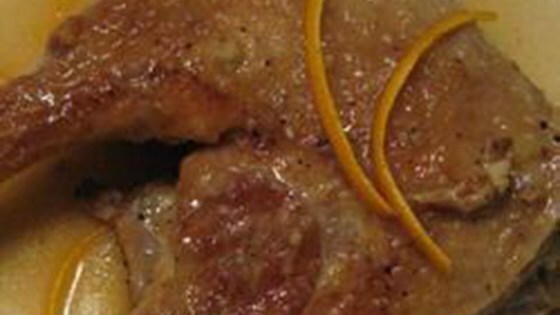 "The delicious flavor combination of duck and orange are brought together in this dish. Duck legs are cooked until meltingly tender in a zesty orange sauce. Enjoy with freshly cooked rice." Heat 1 tablespoon olive oil in a large skillet over medium heat. Add duck legs; cook until skin starts to brown, about 4 minutes per side. Transfer to a large plate. Heat remaining 1 tablespoon olive oil in the same skillet over medium heat. Add onion; cook and stir until tender, about 5 minutes. Stir in cornstarch until dissolved. Return duck legs to the skillet. Pour in orange juice and water. Simmer, covered, until duck legs are very tender, about 40 minutes. Uncover skillet and simmer until sauce thickens, about 10 minutes. Pour sauce into a bowl and stir in zest of 1 orange. Place duck legs on serving plates. Spoon sauce on top. Garnish with remaining orange zest.